It was indeed laid back. Though there were touts calling out to us at every turn, after a day in the medina, they started ignoring us. There are a lot of people around, but it doesn’t feel crowded. Well, it was nothing that we couldn’t handle anyway. Our taxi driver from the train station dropped us off across Bab Mansour and gave us vague instructions on how to go to our riad. We traveled for more than 20 hours, and we were just looking forward to a warm shower, a soft bed and a filling meal. We walked right into what travelers have always cautioned others about Morocco: getting lost in the medina. The path twisted and turned, each narrow path looking just like the others we’ve passed. Luckily there was a sign every couple of meters, pointing us to Riad Hiba. We finally found our home in Meknes, relieved to stop walking, only to be led up a spiral staircase made of bricks of uneven height. After struggling through the last couple of steps leading up to our room, we flopped down on our respective beds and napped. We woke up recharged and refreshed, but also famished. We asked the reception for restaurant recommendations and was directed to a cafe that overlooks the square. 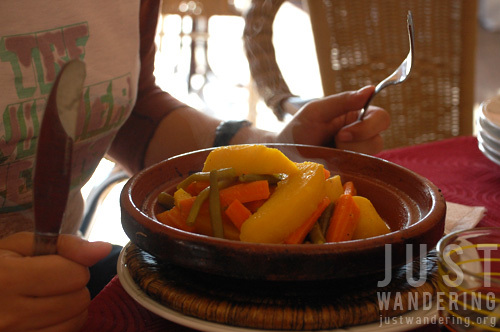 Our first Moroccan taste was of khubz — bread that we would have in every meal. It was eaten with tagine (also first of many) and pastilla, a flaky pastry filled with savory meat, fried and sprinkled with cinnamon and powdered sugar. After our meal, we decided to check out the medina. We just started walking — no maps, no GPS. 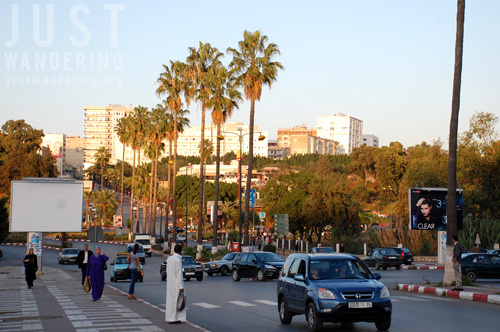 We followed the locals and ended up outside the medina walls and gaping at the picture the ville nouvelle (new city) presented, contrasting greatly from the medina we just emerged from. We delved back into the old city, taking a different way and still managing to find our way back. That’s what I love about traveling: getting to explore and making your own path. 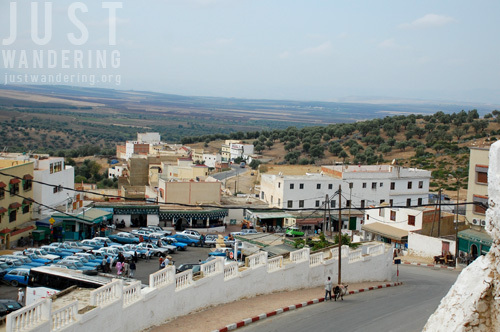 The following day, we made our way to the holy town of Moulay Idriss. It’s funny because when we were asking our host in Riad Hiba for directions, we would ask in English, he would answer in French and we’d understand each other. I don’t know how that happened, but it really made sense. We managed to get ourselves to the bus station and into the correct bus. The bus had no air conditioning, but the weather was cool enough that it wasn’t really uncomfortable (though I dread to think what it must be like at the height of summer). It was a pleasant one-hour ride past fields filled with olive trees. It really shouldn’t have been a surprise when we ended up at a roadside cafe whose specialties were olives. 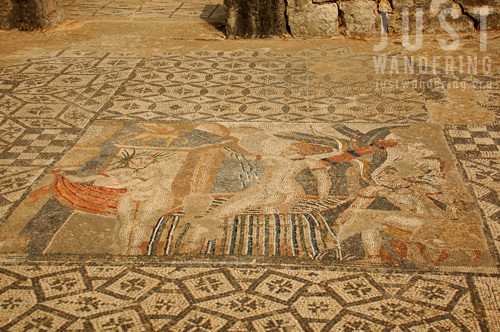 From Moulay Idriss, it was a short drive to Volubilis. 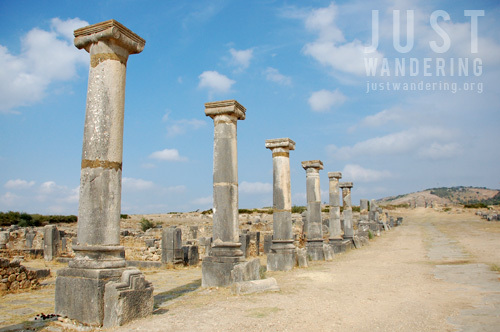 An old Roman town, Volubilis is now one of the best preserved Roman ruins in North Africa. 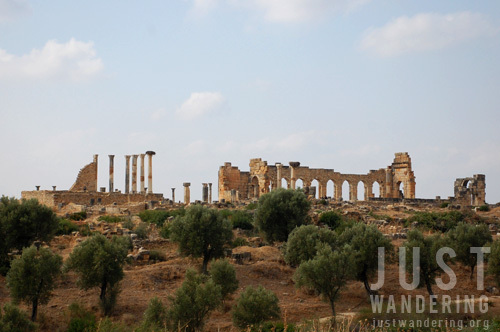 Though it may seem like it’s just a pile of rubble, it’s astonishing to stand there and realize that these buildings have been there for more than a thousand years. I went to Morocco wanting to see a different landscape. It was very different alight. 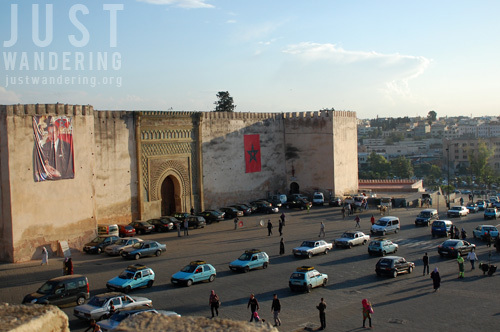 We headed back to Meknes afterwards, making our first foray into the souks and trying out more Moroccan dishes that would be our staple for the next two weeks. 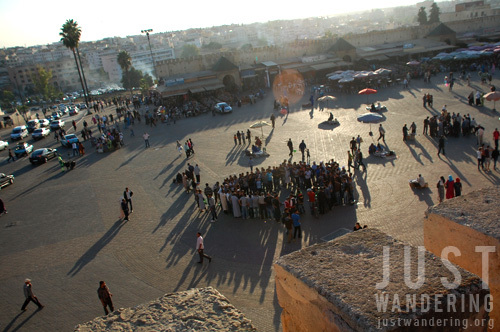 View more photos from my Moroccan trip over at the Just Wandering Facebook page. Ooh… Getting even more excited. Our travel forecast, Morocco soon. Hopefully. Haha. I believe “khubz” is Arabic for bread? I just remember in UAE that’s what we call it. @ “army of grand taxis”. Korak. Redundant word is redundant! Gora kayo sa Morocco! Sulit siya. 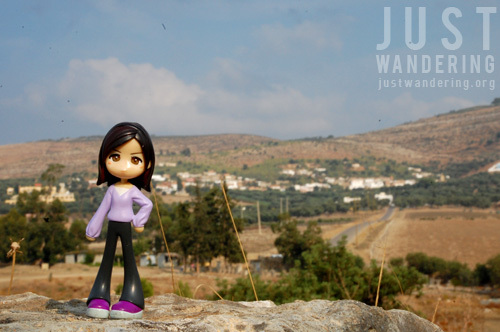 Masaya sa Chefchaouen and Merzouga.